When the outline of the block is apparent through the render, this effect is known as ghosting and invariably results from reflection of penetrating dampness from the underlying masonry. A visual indicator of this effect typically coincides following rainfall as drying begins, the outline of the block shows the differing levels of absorbency of the masonry and its bedding mortar. In the design process, the exposure of the project should be calculated with the following method defined in cycles of wet and drying conditions called ‘spells’ and measured in litres/m²/spell. Consideration should be given to location, orientation and surrounding environment, such as exposure to the force of wind and rain, combined with protection from overhangs or surrounding buildings. For sheltered to moderate exposure it is recommended that the minimum finished render thickness is 15mm, for severe elevations a 20mm thickness is required. Acceptable tolerances are +/- 2mm, so this should reflect in the nominal application thickness to ensure the minimum thickness is achieved. Abutting building components within the architectural design should cater for these thicknesses as a minimum. A contributing factor that can exaggerate this problem in new construction is building components may not have dried out fully from moisture absorbed during the construction process, it is fair to believe this will diminish in time. We would suggest leaving the render for a couple of months to see if the problem improves, this extra time should give the blocks time to fully dry and the render time to fully cure. It is worth considering the impact of continued construction with the completion and addition of further adjacent properties which may offer greater wind resistance and assist in the reduction and severity of the exposure moving forward. Weber recommends that the water shedding capabilities of the render are enhanced by an application of webersil P. Usually two coats of webersil P over two days at 5°C and rising with no frost or rainfall overnight would suffice. webersil P is a high-performance mineral paint that gives exceptional long-term durability and performance. It is anticipated that the use of this product will not detract from the low maintenance benefits of the weberpral monocouche render. Providing that the monocouche render is clean, dry and sound, a direct application of webersil P can be made. The first coat of webersil P should be diluted with between 10-15% clean water and applied with a medium pile wool paint roller. When the first coat is dry - 24 hours later - a second coat is applied, this coat should be undiluted. The application should be in a criss-cross pattern ensuring that the paint is applied evenly, minimising any effect on the scraped texture of the monocouche. Please note when the product is applied to a spray roughcast texture brushes may need to be adopted for the method of application. webersil P is manufactured in a wide range of colours. It is not possible to make an exact match of a synthetic product to a mineral render. This is particularly prevalent in the case of coloured renders as there are many influencing factors surrounding the application that will affect the final cured shade of colour; in particular the point at which the laitance is removed when scraping in the setting process of the render. In certain circumstances, it may be advised that the thickness of the render should be increased, as opposed to painting. Before applying, the area should be stripped of any paint or other coating. Ensure that the facade is clean, dry, sound, dust and algae free. Once the surface has been suitably prepared a keycoat of weberend aid should be applied at approx. 2-3mm thick and stippled to a spiked keyed texture. 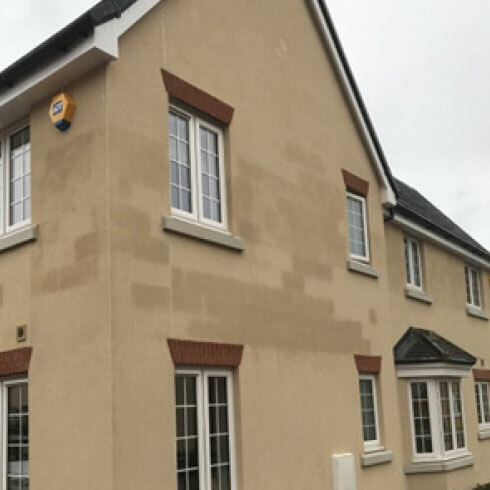 Another pass of weberpral M (or weberpral D in Ireland) monocouche render can then be applied at 10mm and allowed to take up for 5-16 hours (weather dependant) and then scraped to a 6mm finish. Spillages do stain and are difficult to remove so protect vulnerable areas thoroughly and wear suitable protective clothing. Tools can be cleaned with clean water.